Three University of Delaware students studying statistics spent the summer interning with financial and medical research institutions, gaining invaluable real world experience and, for some, job offers. Tom Ilvento, professor in the Department of Applied Economics and Statistics (APEC) in the College of Agriculture and Natural Resources (CANR), said that internship opportunities are important for every student but especially for statistics majors, as it “opens the students’ eyes to a bigger vision of what their field is about and what they can do and what kind of skills they really have. “We preach a lot that as a stat major, you’re different, you have a lot of skills. But I don’t know that they appreciate it until they get into a setting where they have to start using it.” Using their skills were seniors Heather Bowman and Zachary Baine, who completed internships with financial institutions, and Qiuming (Mark) He, who worked with a medical research organization. Ilvento said he was pleased with the students’ work over the summer, pointing out that they went out on their own and actively sought out the internship opportunities and then excelled in their respective positions. “I was impressed with all three finding positions and I was really happy for the experience they had. They were all involved in real world problems in groups, and they were participating members, so these weren’t internships where they went and got the coffee — they really got involved and were able to do things and contribute to their teams.” The undergraduate internship program in statistics is not as developed as the statistics master of science internship program, which has up to 17 students each class in year-long internships with local companies such as DuPont, Conde Nast, Chase, Bank of America, and PNC Bank. However, Ilvento noted that APEC would like to head that way with undergraduate internships and this past summer was a great start in that direction. “Ultimately, we would like to see more undergraduate statistics majors intern each year,” he said. Heather Bowman Bowman spent her summer interning at Chase Bank in Wilmington, working with a marketing manager on a partner credit card for the InterContinental Hotels Group (IHG), a brand that owns facilities such as the Holiday Inn. “Every week I would do acquisitions reports — looking at how many new card members we had from in a hotel and how many we got from various sites or emails — and then I would present that on a phone call to our partner,” said Bowman. She also explained that she looked at the net promoter score, which told her how pleased current card members were with their card and the reasons why, from which she could report on whether changes the credit card company had made recently were making card members more or less happy. 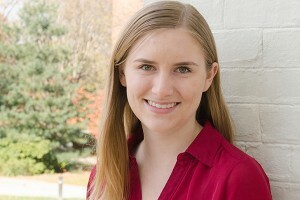 Bowman said that having an analytical background from her undergraduate courses at UD helped her as she applied what she learned in the classroom to the world of work. “Having the analytical background and thinking came in handy when I looked at the data and tried to figure out what to do with a gigantic spreadsheet and how to make sense of the numbers.” Another thing that helped was her knowledge of Statistical Analysis Software (SAS), a program that she learned how to use in class. “I took a master’s level statistics class that taught SAS and that’s something that a lot of companies like to see, so I thought that helped because I actually used that this summer at Chase to work on a couple of reports.” Zachary Baine Baine interned at American Express in New York City. He explained that his main project was researching card member data, trying to find certain trends and looking at metrics. “I was analyzing those metrics and trying to figure out how we could predict them and use the information to try to generate more revenue growth.” Baine said that the people at American Express were hands-off, trusting that he would get his work done, which he did thanks to the foundation he gained in UD’s statistics program. “Some statistics classes for regression analysis really helped me and I used that often,” said Baine. He added that the computer science and programming classes that he took as a requirement for his statistics major helped him understand some of the coding language. 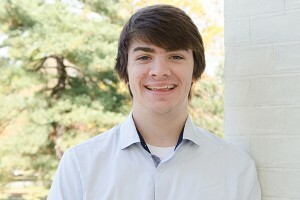 “The statistics courses built a foundation for me so that I could stare at all this data and try to figure out what was going on.” As for his favorite part of the internship, Baine said that was easy: the end when he was given a job offer. “I was lucky enough to receive a job offer and for the interns that did get a job offer, they brought us all up to the top floor, the CEO’s floor, with this luxurious conference room,” he said. 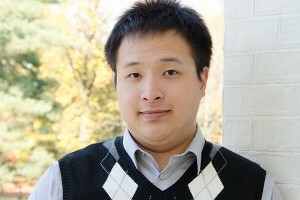 “They put us all in there and had the CEO of the company come in and congratulated us, so that was a good way to end the internship and left the most lasting impression on me.” Qiuming (Mark) He He spent the summer working at the Stowers Institute for Medical Research in Kansas City, Mo. The facility had many individual labs, but He explained that he worked for the core facility for bioinformatics, helping to process data and provide consultation for scientists. “They came to us if they had any questions,” He said. “Usually they could handle their data by themselves but if they had some difficulty, they came to us and we figured it out or gave them advice on how to approach the data.” He worked with a program called R, software with which he had no previous experience prior to the internship. “I heard the name R but I never touched it and then in the first two months, I was doing some tasks and practicing, and in the last month I did my project just using the R software.” He said that all of the skills learned in the statistics program at UD came in handy, as he had experience programming in other languages and only had to adjust to the syntax changes. He also said that the skills he learned at UD, such as critical thinking and ways to approach data, helped him out, as well. As for statistics in general, He said that he loves how the practice allows him to help people. “We can really talk to people and see what they want and then we have the data as the backup. We can come up with the result and then we have to back that up so it’s really solid, and I like the feeling of making people happy when they see what they think is actually statistically significant. I really like seeing that they meet their expectations.” Article by Adam Thomas Photos by Danielle Quigley This article can also be viewed on UDaily.